We are a small home based breeder in Alberta, Canada breeding Australian Cobberdogs. We are not a kennel. Our dogs live with us in our home as part of our family. Our dogs are imported from Australia directly and are carefully selected for temperament and are extensively health tested and screened. We are very selective with our breeding and focus on breeding healthy service and therapy quality puppies with an exceptional pedigree. Australian Cobberdogs have a thinner, silkier, non shedding, low odor, allergy friendly fleece coat for lower maintenance. Their coats come in a beautiful wavy or curly fleece, in the colors of brown, cafe, blond, white, red, black, and gold. They really look like big huggable fluffy teddy bears.
. Rare intuition that allows them to "know what your feeling"
Their easy trainability makes them ideal for people looking for the ultimate service dog, therapy dog or medical alert dog to people who suffer from dog-related allergies. Australian Cobberdogs have a high level of intuition and ability to "read" their humans making them perfect for homes with children with developmental disabilities or emotional health challenges. They seek eye contact and look deeply into your eyes rather then "at" you. They are the ultimate family companion. They are affectionate, full of personality, gentle and love kids. They enjoy spending time with you and being part of the family. The Australian Cobberdog does not bark excessively. ​They come in different sizes such as mini, medium and standard size. We are currently breeding mini/medium size. We are proud to be members of the MDBA (Master Dog Breeders & Associates) and the AIACC (Australian & International Australian Cobberdog Club.) We are a registered breeder of the pure- breed Australian Cobberdogs. All of our dogs and puppies are registered with the MDBA. If you buy a puppy from us, they will also be registered with the MDBA. 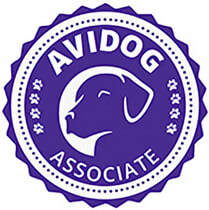 We are a proud member of AviDog, an organization that teaches and promotes excellence in breeding, whelping and raising puppies. Their goal and ours is to raise happy, healthy and well-adjusted dogs.